Amritsar Group of Colleges (AGC), Amritsar signed a Memorandum of Understanding (MoU) with King Mongkut’s University of Technology ..
Amritsar College of Engineering & Technology, Amritsar hailed new faces for academic session of 2018 by organizing a magnificent Freshers’. AGC celebrated InternationalChefDay comprising theme “Food for Growing Up” with a great zeal in the college campus. Hmct organizing event. 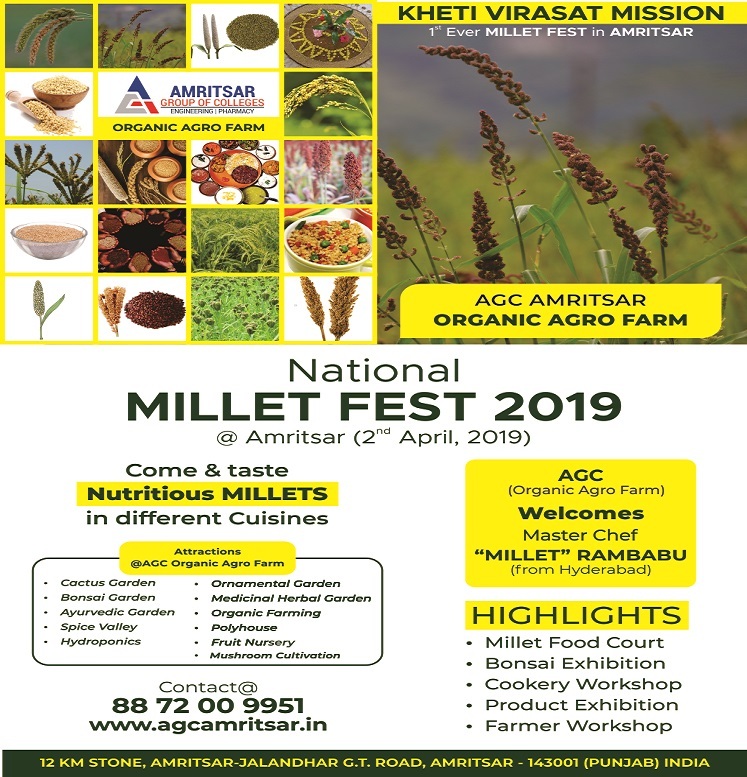 AGC Amritsar is going to organize a National Millet Fest (A fest in which there is lot to explore about Millets.) in Collaboration with Kheti Virasat Mission (A civil society movement with a deep compassion for Nature) on 2ndApril, 2019 in Amritsar Group of Colleges at AGC Organic Agro Farm(An alternative agricultural system i.e. organic farming,one of the most valuable techniques to be used in modern farming as well as traditional farming. Organic unit of ACET, Amritsar allows the students to learn about these techniques. Under the organic farming, Crop Diversity, Soil Management, Weed Management and controlling other organisms is also a part of usual practice in the college. With an aim to provide practical exposure to the students of agriculture the organic unit provides various gardens and deep learning about various crops ,vegetables and plants in them.) It is the first ever Millet Fest in the Holy City Amritsar. Be a part of the fest and explore nutritious Millets in different cuisines.